Whole Person development for student success. Our middle school expands student responsibility and their subject offerings. The whole person development begun in elementary school is strengthened or maintained. Sacred Heart Catholic School’s middle school includes its sixth, seventh, and eighth grades. Subjects are taught in a departmentalized system of seven academic periods. The diverse curriculum implements the Diocese of Richmond’s Consensus Curriculum for overall guidance. This curriculum meets and exceeds the requirements of the Standards of Learning (SOL) for the Commonwealth of Virginia. The middle school program prepares students for success in high school. The middle school student has a variety of expanded subjects to master. Science, religion, and social studies become much more important at this level. A middle school Sacred Heart student is challenged to think critically with all of their subjects. The school uses problem-based educational approaches integrating the latest educational technology tools. Sacred Heart class sizes are kept small to allow for greater contact time between the teacher and the student. Small classes are especially important for inquisitive middle school students. Computer/technology labs and a traditional library provide students the resources for class activities and projects. Books for recreational reading are also available. Middle school students must pass all subjects in which they are enrolled. Students who do not meet the requirements for promotion are not eligible for re-enrollment at Sacred Heart Catholic School. The Terra Nova standardized test administered in seventh grade. Sacred Heart Catholic School offers the following middle school courses. All Sacred Heart courses are designed to align with most public school systems, which provides easier transfers with public schools. Being able to communicate effectively, both oral and written is a key skill for Sacred Heart middle school students. Strong communication is needed in almost every occupation, relationship or education. It is vital for higher level testing and educational advancement. Sacred Heart students study the traditional areas of literature including the novel, short story, nonfiction essay, drama, and poetry. They learn literary structure and terminology through lecture, class discussion, and written/artistic projects. They read a variety of books independently, and take on active roles in critiquing new novels. Sacred Heart teachers strongly emphasize the development and use of composition skills throughout all subject areas of the middle school curriculum. Writing compositions, oral presentations, and studying English grammar are part of the ongoing curriculum. Students compose letters and personal narratives; expository, persuasive, and comparative essays; and poetry and fictional stories. The writing focuses on organization, ideas and content, sentence fluency, and voice. In addition, students practice creating and delivering clear and concise oral presentations. Grammar focuses on punctuation and capitalization, part of speech, and other rules of English. Math teaches logic, quantity, space, change, and structure. 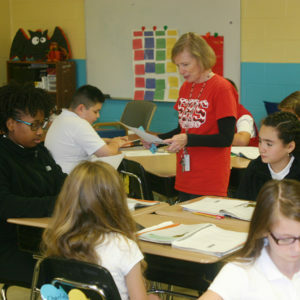 Sacred Heart middle school students are taught math to mastery with the goal of earning high school credit for Algebra I before students leave the eighth grade. General Math emphasizes the basic operations including fractions and decimals. Measurements, percentages, patterns, problem-solving, ratios, and basic geometry are also part of the sixth-grade course. The course introduces students to integers, variables, and simple graphing. The class emphasizes and practices problem-solving throughout the year. Pre-Algebra prepares the seventh-grade student for Algebra I by focusing on integers and equation solving. The course covers ratios, powers, and exponents as well as extensive coordinate plane graphing. Students practice problem solving throughout the course. Eighth-grade students are placed in one of three math levels (Math 8, Algebra I, or Geometry) based on their individual aptitude. Algebra I is an advanced course equivalent to average ninth grade math. Algebra I moves at a fast pace and is taught as a high school level course and includes end-of-semester exams. Eighth-grade students solve, write, and graph both linear and quadratic equations and inequalities. The study of exponents and ratios continues from Pre-Algebra. The course introduces polynomials, factoring, rational expressions, functions, and radicals. Students practice problem solving throughout the course. Geometry is an advanced course equivalent to a high school math course. Geometry is taught as a high school level course and includes end-of-semester exams. Geometry emphasizes the study of the properties and applications of common geometric figures in two and three dimensions. It includes the study of transformations and right triangle trigonometry. Inductive and deductive thinking skills are used in problem-solving and are related to real-world problems. Writing proofs to solve (prove) properties of geometric figures are utilized. Geometry prepares a student for high school level Algebra II. Sacred Heart’s social studies survey American history, civics, and economics in the context of societal change. Geography is applied through the study of these courses. Students discuss decisions and outcomes in the course of the studies. American History from 1860 to the Present is the focus of the sixth-grade social studies course. The use of current events helps students connect with the past as well as understand changes in society. Instruction emphasizes correlating and sequencing events, writing and map skills, and reading comprehension. Students learn to outline which they practice throughout the year. The students complete outside projects both individually and in small groups. Civics includes an in-depth study of U.S. Governmental system at the national, state, and local levels. The course provides insight into both the formal and informal mechanisms of government. Government systems from around the world are also introduced with comparisons to the U.S. model of government. The concept of citizenship and what it means to be a good citizen is discussed. Current events are a potential factor in course discussion and problem-solving. Economics provides an introduction to basic economic theory and how various political systems and government types drive economic growth. The role of monetary policy, taxes, private investment, and property ownership are examined under capitalism, socialism, communism, and other societal structures. History is surveyed to provide the historical significance of these systems in an economic context. Middle school students gain knowledge about or study the natural world based on facts learned through experiments and observation. 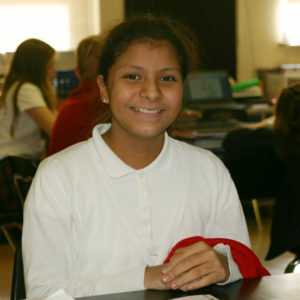 Sacred Heart’s science curriculum surveys multiple areas and prepares its students for success in higher grade levels. Life science focuses on the different forms of life on earth in the sixth-grade. Instruction in cell theory and genetics includes historical perspectives as well as an investigation into more recent discoveries including the basics of cloning and the Human Genome Project. Students study the cell and its organelles. Microscopes, the Internet, and other types of technology enhance science studies. Life science includes the classification of organisms and the dissection of worms and frogs. Studies include diversity and adaptations of organisms. Students observe species from each kingdom and discuss how they affect humans. The class also covers theories of life science, scientists, and major discoveries. Physical science is the focus of the seventh-grade. Students receive in-depth instruction on the atomic structure. Chemistry experiments provide ways to explore various types of mixtures, chemical properties, and physical properties. Students memorize the elements on the periodic table, including the atomic number and symbol. Students may be required to choose an element and complete an oral and visual report on their choice. Earth Science introduces eighth-grade students to the Earth’s structure, geologic processes, plate tectonics, oceans and the water cycle, Earth’s atmosphere, weather, and climate. Students also investigate how the motions of the sun, the moon, and Earth create days, seasons, years, eclipses, phases of the moon, and tides. They further explore our solar system, stars, and other galaxies. Sacred Heart believes recess provides an opportunity for middle school students to exercise, interact socially with friends and clear their heads. Recess is an extended break that prepares the student for more study in the completion of their academic day. Recess normally occurs around midday with the student’s teachers. When possible, Sacred Heart arranges for field trips and excursions which enhance the curriculum. These are usually taken during school hours and provide more context than the classroom instruction alone. The outings are planned educational activities designed for students in their particular grade level. These are exciting events that help keep education and learning fun for all students. Middle school reinforces good student study habits. Excited teachers make the coursework easier and fun.